Does Your SMSF Meet The In-House Asset Rules? Many SMSF trustees are unsure of what to do when their fund is found to have breached the in-house asset rules. There are also some common misconceptions about these regulations that keep resurfacing. Recent ATO statistics on the SMSF sector show the proportion of reported breaches that relate to the in-house asset rules remains high. While it can be argued that the higher number is because the in-house asset provisions are by far the most complex and hard to understand SMSF investment rules, as a trustee it is still critical for you to improve your compliance to prevent the substantial penalties imposed for breaching these rules. What is an in-house asset? An in-house asset is a loan to, lease to, or an investment in, a related party of the fund. 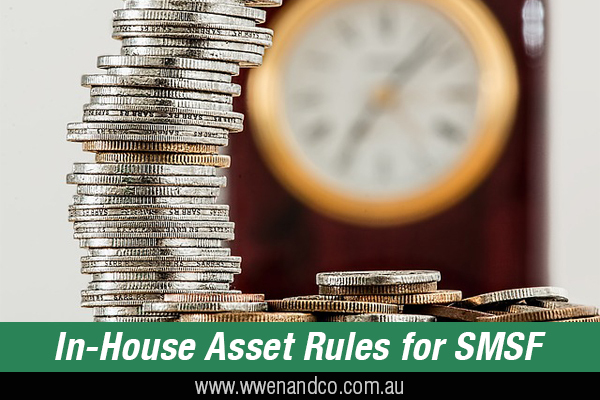 The term “related party” is relevant for an SMSF for the purpose of ascertaining whether an investment constitutes an investment in an in-house asset. Full discussion of the definition of a related party will take up more space than we have available here, but the key issue for our purposes is that a related party will include the fund’s members, their relatives, and entities such as companies or trusts that are controlled or majority-owned by members and their associates (that is, relatives of members, partners in partnerships with those members, and companies or trusts that are controlled or majority-owned). Whether or not a particular investment is an “in-house” asset of the fund is important because as a trustee you must not invest in assets that cause the value of the in-house assets of the fund to exceed 5% of the total market value of the fund’s assets. How does the limit of in-house asset work? In-house assets are measured at market value, and the market value ratio of 5% (that is, market value of in-house assets expressed as a percentage of the market value of total fund assets) applies to all regulated superannuation funds. This low percentage was mainly designed to limit the use of fund assets by related parties to protect the retirement benefits of members. Perhaps one of the most important points to note is that the market value ratio must be tested at June 30 each year, as well as during the course of the income year that a new in-house asset is acquired by the fund. What will happen if I exceed the in-house asset limit? Set out what steps you will undertake to get the limit below 5% (generally by disposing of or selling excess assets). Each trustee of the fund must ensure that the steps in the plan are carried out within the next year of income. Another provision of the same legislation applies during the year when a new in-house asset is acquired, and prohibits the acquisition of an in-house asset if the market value ratio already exceeds 5%, or, if this level is not exceeded, applies when acquiring an in-house asset that would cause the ratio to exceed 5%. This means a trustee is only allowed to acquire an in-house asset provided the percentage of the total in-house assets involved does not exceed the 5% limit. In addition, an SMSF loan to a related trust/company would not be prohibited under superannuation laws (subject to 5% in-house asset rule) on the assumption that the loan is not made to indirectly facilitate loans/financial assistance from the trust/company to fund members and/or their relatives. Otherwise, the fund may be in breach. Case of in-house asset breach or not?